Rue89 has run an artical on my good freinds Dave. H and Dave. 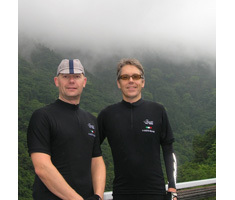 K and thier L’Etape du Tour challenge to raise money for the Tyler Foundation! If you haven’t already donated please head on over to the Tyler foundation and chip in! Even if it’s only ¥500 every little bit counts! Also, if you can post the links and stories up on your blogs, websites and send it via e-mail to everyone you know it would really help spread awareness and hopefully, more importantly donations! All the best to them and hopefully they will keep us updated with their efforts! So far the duo have managed to raise more than ¥2,172,219 ! All of which will go directly to the Tyler Foundation. So please spread the word and chip in! Hopefully in the next few days I will post some more exciting news that will hopefully get you in the mood to chip in! All the best Dominic and James!